As far as fitness equipment goes, the Ironman ATIS 1000 AB Training System Inversion Therapy Table is a quality piece of kit and continues to get great customer reviews on many online store websites. However, it does differ from other inversion tables in a couple of crucial ways in that it can be used as an inversion table and also an AB training system for back stress. Firstly, because of its AB and core training system, the table isolates the abdominals much more effectively than bench training would, letting you build and strengthen your abs with just a few minutes of work daily. Secondly, with up to 10 different inversion locking angles, this table helps prevent any falling while inverting. It also helps to achieve body flexibility as well as reducing the effects of aging and optimizing lumbar traction. It is certainly a solid, quality combination inversion therapy table and ABs training system with many great features, ensuring effective and safe operation for the reduction of back stress and/or abs training. The table assembles quickly and easily (about 45 minutes or so) if you read and follow the well-written instructions. Included with the table are the necessary tools to assemble it. The ATIS 1000 AB is designed as a combination inversion table and ab training system for reducing back stress and stimulating blood circulation effectively. The “Scale Locking System”, provides for easy locking adjustment for the 10 different inversion locking angles, including one for the full 90 degrees. Solid construction. This table is constructed of durable oval steel tube framing with a scratch-resistant powder-coated finish. There is a memory foam vinyl pillow which provides ample head support, therefore ensuring a comfortable operation. For security purposes, the scale locking system provides easy ankle locking adjustments. Ergonomically molded “Comforter” ankle cushions prevent any pinch point pressure to the ankles and ensures comfort during operation. The machine comes with a durable steel frame which is height adjustable for people up to 6 feet 6 inches. It can also accommodate persons weighing up to 300 pounds. It measures 26 x 62 x 49 inches (W x H x D). The inversion process is smooth, comfortable and easy. You rest your body against the nylon backrest and slip your feet into the ankle cushions, reach your arms over your head and your body will gradually invert to the preset angle. There is a memory foam pillow providing head support and inverted, foam dipped hand grips allowing for maximum stretching while inverted. The unit has extra-long safety handles making it easy to return to an upright position. You can easily set the position that is optimum for you with its ten different inversion locking angles. The unit folds down to 29 x 30 x 76 inches for easy storage. Because the Ironman ATIS 1000 AB is of solid construction, it can be quite heavy at 76 pounds and care should be taken when moving it. As well as ensuring safe operation through its sturdy and strong build, it also further enhances security with its tough rubber non-skid floor stabilizers which keep the table stable while you invert. The ankle locks provides easy ankle locking adjustments while the extended foam safety handles allow for easy return and body positioning. 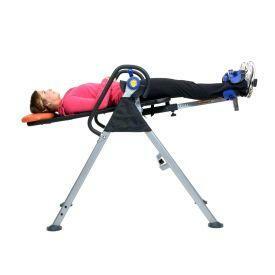 The Ironman ATIS 1000 AB Training System Inversion Therapy Table is very stable. This is a point greatly appreciated by owners who like this feature since it is very important they have an inversion therapy table that is strong enough to be used safely when hanging upside down making core exercises safe and effective. Vinyl safety side covers protect hands and fingers during operation. An additional feature of the design is a side holder for things such as watch, cell phone, wallet, eyeglasses, coins etc. This means you can keep these handy next to you when you invert. The 1000 AB doesn't just carry out its operation efficiently; the design also ensures the feeling of safety and being secure during operation. This is due to its solid, heavy duty steel frame and sturdy construction. During inversion, it also allows for free movement of arms, making it very comfortable to use. It allows the table to be locked at up to 10 different angles. Heavy, tough but durable nylon backrest. 10 different inversion easy locking angles. The headrest cannot be adjusted. To put it in the right position for my needs, I have to remove one of the bolts and then rotate the table. When folded up, it is quite large and heavy. It is therefore best to keep it in the location where it is to be used in order to avoid having to keep moving it around. However, for many users, this fact is preferable since it assures them that the table is strong enough to hold them while they hang upside down. It is also a quality ABs training system. How Can The Ironman ATIS 1000 AB Help You? Because of how sturdy and easy to use it is, at under $200, it offers great value for money.